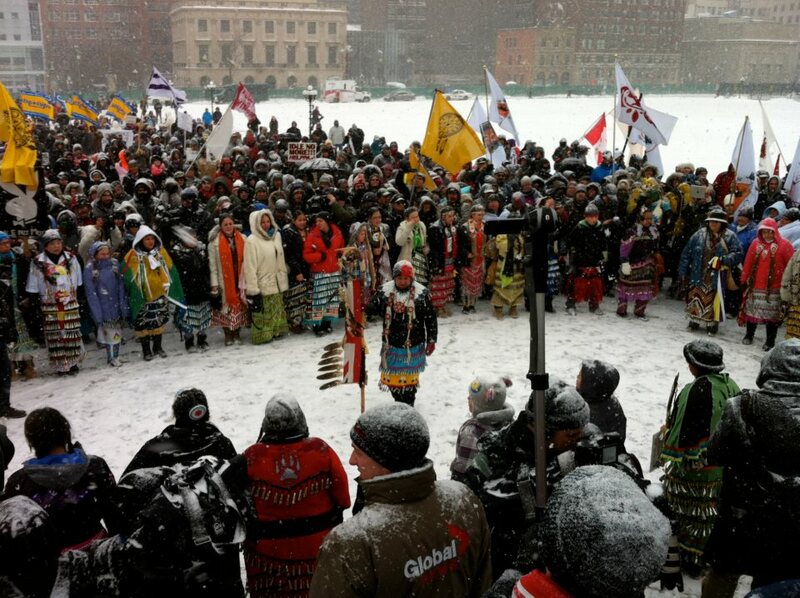 Women jingle dress dancers at INM rally in Ottawa, Jan 28, 2013. January 28 was Idle No More’s “Global Day of Action,” yet another in a series of rallies meant to put pressure on the Canadian government to rescind Bill C-45 and engage in “meaningful dialogue” with Native peoples. The date was chosen as it is the day when members of parliament resume sitting in the House of Commons, located in Ottawa. Unlike previous days of action, this one was also called with Common Causes, a new (and little heard of) coalition that includes the Council of Canadians, environmentalist and labour groups. Despite the new coalition and nearly two weeks of promotion, however, numbers were far lower than previous national days of action, such as those on December 10 and 21, 2012. These mobilizations each saw several thousand Natives rally across the country, accompanied by several blockades of railways and highways. 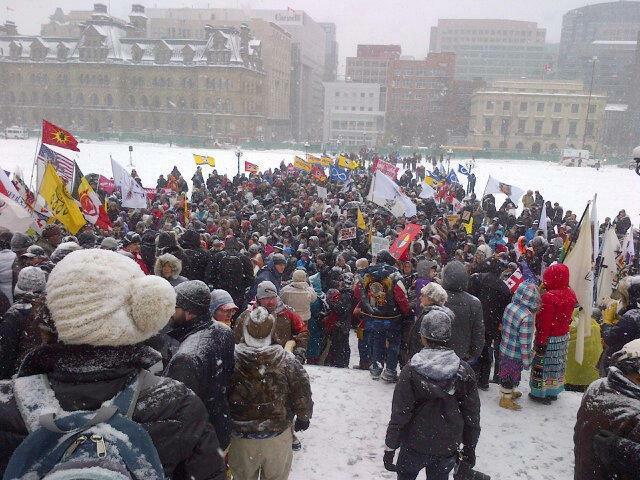 Ottawa, INM rally Jan 28, 2013. Ottawa, which had seen many as 4,000 rally on December 10, saw less than 600 people on Jan 28. 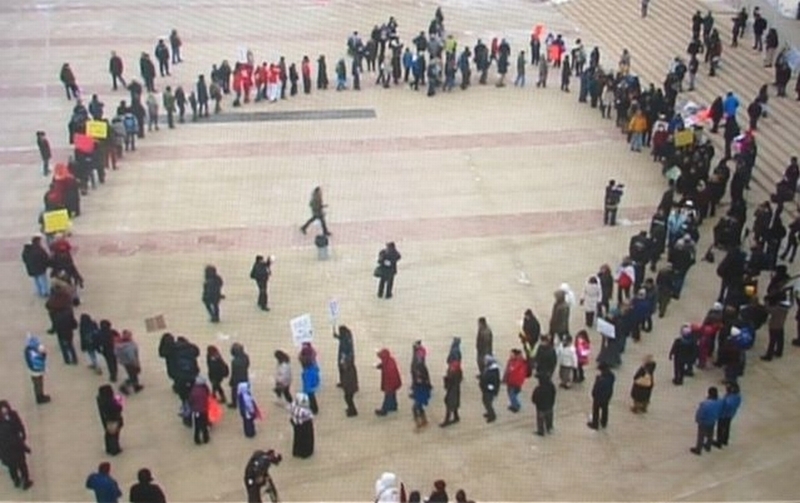 While perhaps as many as 2,000 rallied in Edmonton on Dec 10, less than 500 attended on Jan 28. 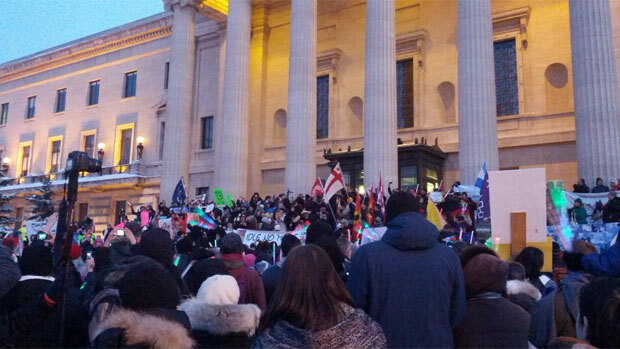 Winnipeg, which had also seen some 2,000 rally previously (on Dec 21), saw an estimated 800 gather at the Manitoba Legislature (despite the scheduled appearance of singer Buffy Ste-Marie). INM rally at the Manitoba Legislature in Winnipeg, Jan 28, 2013. The one significant direct action that did occur on Jan 28 was an hours-long blockade of the Snow Lake mine in northern Manitoba. A reported 30 protesters from the nearby Mathias Colomb Cree Nation were involved in the action. Internationally, there appeared to be many more rallies and round dances across the United States than previously, although these were also smaller. There were also solidarity rallies in countries such as Australia, Croatia, Norway, Sweden, etc. Most of these rallies were small, with less than a dozen people participating. 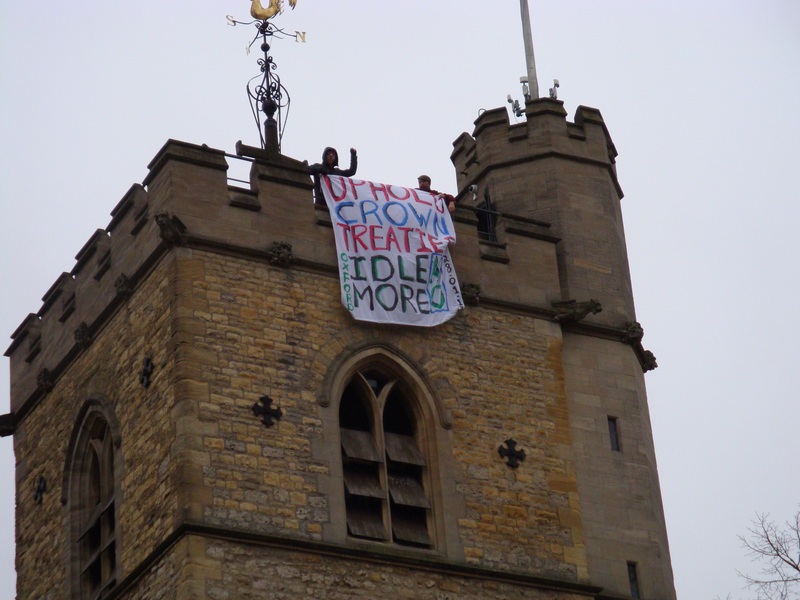 In Oxford, England, people dropped a banner over a tower wall calling for the Queen to honour her commitment to Crown treaties made with Natives in Canada. INM round dance in Toronto, Jan 28, 2013. Over the last two weeks, since the last big days of national protests on January 11 and 16, there has also been a steady decrease in the numbers of flash mob round dances, which at some points had been occurring multiple times on the same day in some cities, involving hundreds. What has led to the seemingly drastic decline in numbers? There are undoubtedly many factors, such as the ending of chief Spence’s fast on Jan 24 (which had created a high level of emotion and concern among Natives), the mixed messages and confusion caused by the Assembly of First Nations internal divisions, as well as the January 11 meeting with Harper and some AFN chiefs. Many Natives may have also felt frustrated by the circular trajectory the movement had taken, that after weeks of rallies, flash mobs and blockades, the end result was another government meeting with the chiefs. INM round dance in Kingston, Jan 28, 2013. In addition, there were mixed messages coming out of Idle No More. While it was proclaimed that INM was a grassroots movement with no official leaders or spokespersons, the “official” founders of INM continually issued statements about how the movement was to conduct itself, and distanced themselves from any “illegal” actions (such as the symbolic blockades). Then there was Bill C-45, the federal omnibus bill that had been the primary target of INM when it started back in November. By mid-December, however, the bill had been passed in the House of Commons and received royal ascent (an archaic tradition leftover from Canada’s legacy as a colony of Britain). Not only has the bill not been scrapped, the federal government has given no indication that it is considering revising any portion of it. In this regard, INM has not been successful and the countless rallies and round dances were never enough of a threat, nor was the movement as a whole, to force the state to concede anything (other than the symbolic January 11 meeting). 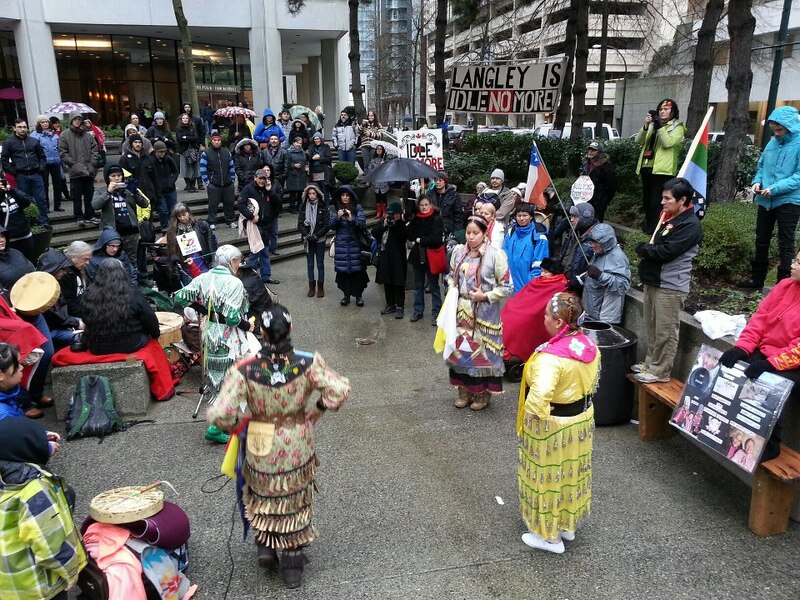 INM rally in Vancouver outside Aboriginal Affairs and Northern Development building, Jan 28, 2013. Like Occupy, which had in most cities peaked by the end of October (after one and half of months of intensive organizing), Idle No More has most likely reached its climax and will be unable to mobilize the same numbers as it had in December 2012. This will not stop small groups of committed individuals and newcomers from continuing to organize flash mobs and rallies over the next few months, however, as also occurred during Occupy. But these will most likely become even smaller and more marginalized over time (i.e., Occupy). In the meantime, INM (official) has moved into the realm of teleconferences, social forums, and alliances with other like-minded, non-Indigenous, reformist groups. Its pacifist methods are firmly entrenched, as are its strictly legal methods, the apparent results of both ideology and an acute sensitivity to public opinion polls. INM round dance in Edmonton, Jan 28, 2013. In Canada, most Occupy sites began to “idle” around late October (after a month and a half of activity). Organizers were struggling with declining numbers, increased attacks by business associations and corporate media, and a growing sense of disunity within the ranks. Around this time there began efforts to renew the movement, and one result was a vast increase in bureaucracy. New committees were set up, then sub-committees and then sub-committees of these, and on and on. The idea seemed to be that the more they “organized” Occupy, the stronger it would become, until it was the truly mass movement of citizens envisioned by its founders. This was not case however, as under these conditions small groups of determined organizers simply burn out. Despite this, Occupy had a significant impact on the social consciousness and changed the lives of many of its participants. The high levels of public support in the early periods of Occupy also revealed the yearning for social change among broad sectors of the population. Banner drop in Oxford, England, Jan 28, 2013. Idle No More has had a similar impact on Indigenous peoples in Canada, empowering many and mobilizing them into a campaign that at least spoke about protecting land and water. It has indeed changed the lives of many of those who participated. At this time, however, it appears to have reached its limits, and organizers will now most likely turn to creating more bureaucratic structures and “official” chapters as a means of compensating for its decline in numbers. Posted on January 30, 2013, in Uncategorized and tagged #IdleNoMore, Idle No More, Idle No More global day of action, native protests. Bookmark the permalink. 20 Comments. They are dancing for all of us! Props to Zig Zag for his continuing coverage of this movement. When all this started I identified Idle No More as an Open Source Protest movement. Such movements need a single, simple, plausible promise around which people can rally. I identified this plausible promise as: “Force a meeting between the government and Chief Spence.” Since the end of Chief Spence’s hunger strike the plausible promise is gone. Thus, so is the Open Source Protest unless a new, simple, plausible promise can replace it. 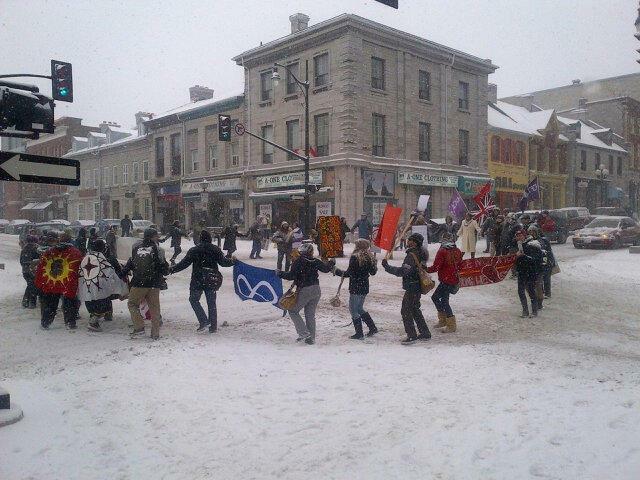 I believe strongly in the Idle No More movement and I go to all of the events that I can. One thing I have noticed is that there is a flood of events. And I wonder if they are not suffering from both core supporter burnout as well as General Public INM Burnout. You can not expect the general population to a) come out and support nor b) have the patience to tolerate protest marches, education events, etc etc every week, month after month. In some areas there are multiple events each and every week and that has been going on for a period of months now. Even the most eager and loyal members will burn out. And the general public soon tires of the disruption of traffic flow, both pedestrian and vehicular, and all that goes with it. They also burn out of the “Protest Mode” and are not as likely to come out to support you. There comes a time when many movements decide that it is better to hold one or two events a month, and to focus all resources on those one or two events and avoid the burnout. I hope and believe that is what we will start to see. I agree, fatigue and burn out are real factors that lead to decline in social movements and their activities. Hopefully after the hype dies down, we can all reflect on what we’ve learned and move forward. Absolutely wrong. We have taken a long long time to get to this point. Sounds like your confidence is shaken. Change doesn’t come over night. This red winter will turn to a red spring then a red summer. Let warm weather heat things up. Fighting greed is only getting underway. Patience please. The people are just now waking up. My confidence isn’t shaken as I never believed that INM was going to do anything more than it has thus far accomplished. I agree that the people are just waking up, but I’d advise them to grab a pot of coffee. Regardless it is WORLD WIDE BABY!!! By this you must be referring to the handful of solidarity rallies and individuals posing with “I support Idle No More” placards that have proliferated over Facebook. In the lead up to the 2003 US invasion of Iraq some 15 million people around the world were protesting. That is “world wide baby,” but even then the passive peaceful protests didn’t disrupt the war machine. Most people, including Indigenous folks, are largely non-proletarian in imperialist countries. There is a HUGE difference between living on $1/day (U.S.) vs. $7/hour (U.S.) @ 8 hours per day (plus govt subsidies, however meager). The real proletariat are those who materially have nothing, recognize that the governments of the capitalist class (including the Band Councils and even some wanna-be chiefs on the grassroots level) must be overthrown, and are willing to die for to make that happen. Anything else is dancing for the tourists. And right now, the reason we see the ‘peak’ of Idle No More, is because, like Occupy, the suffering of the people, all the people (not just the indigenous), on the continent of North Amerikkka, has yet to ‘peak’. We all must suffer more in order to eventually suffer less. Take note that INM in Mexico is GROWING, as part of a larger movement, with the EZLN and the people of Guerrero and Atenco at its lead. This is due to the material conditions those people face everyday on a mass scale. INM and Occupy-supporters still largely have the option of returning to their normally quiet, routine, day to day. This is why a relatively dedicated few remain in Occupy (“the zealots”, “the freaks”, “fanatics”, “cultists”, “sectarians”; also “the astute”) and this is the direction Idle No More is going. It is also politically immature, ahistorical, dogmatic, and (frankly) liberal to assume that this is “over”. This a very amerikkkanized Hollywood/NBC sit-com type mentality. ; as if over 400 years of kkkrap can be transformed in 30 minutes or less. Lol. I agree that it ‘s easy for many to lose inspiration and hope and it seems as though numbers are dwindling, but I believe that IDM’s work has only just begun, and that more strategizing needs to take place, along with more education and teach ins, and building the bridge between FN and Non Aboriginal Canada. This is a very very important movement that if done properly with the support of other organizations such as Council of Canadians, Amnesty etc we can get our message across to others. It’s easy for people to carry on with their lives and turn a blind eye, as it can be overwhelming to fight for this cause, leaving many people feeling powerless, but with more education and creative ways to get the message across I believe we can do this! I myself am now at the beginning stages of a very big Non Profit Org that will help induce this change, and it was Idle No More that inspired me to get this rolling after 14 years of “thinking” about it. Don’t give up hope! This is probably the most important thing we will all ever stand up for and that is to save our water and land. Numbers may be down but the word is spreading across the world as we have more support than we know. Don’t give up hope! We must save Mother Earth, because without her we have absolutely nothing. Tanya, I agree that INM just begining to act on people minds. Many friends who were prejudiced against Natives are now more informed and have better judgment. The planet is ready for awakening. INM has good cause and good timing. And advantage for INM: The romantic image of thew north american indians make Natives good spokepersons for the Idle population of the world. Natives represent the first ecologists! This essay looks to me like a real effort to understand and I am impressed and applauding you tonight for writing it. One of the other commmenters criticized you for thinking that INM is ‘over’ – but I do not think that you think it is over (please pardon the convolution there) – it looks to me like you just stopped writing too soon for one reason or another. So it goes. Thinking of bureaucrats taking things over would certainly do that to me. Your phrase “at least spoke about protecting land and water” is right on point for me. That is exactly where I diverged from Theresa & Raymond – when I heard in their statements that ‘the environment’ (call it what you will) was not at the very centre of their motivation. Nonetheless, what they achieved (for me) was opening a door into what I think the next stages of this struggle will be. The struggle I am thinking of is not specifically Native, though it could not be without. It is not specifically Christian either – but could very well be without. It is definitely not Socialist or Union oriented; nor has much to do with the large NGOs such as Sierra Club & Greenpeace, Council of Canadians … indeed, not much to do with the smaller ones either – their focus seems to be too narrowly restricted by the necessities of fund raising. You say, “The high levels of public support in the early periods of Occupy also revealed the yearning for social change among broad sectors of the population.” Yes. I was surprised at the outset of Occupy Toronto to find thousands of people at the start of the march. Yes, it dwindled and mostly vanished, and for good reasons as your analysis indicates – but the yearning is still there and will only increase and broaden (and deepen) as we step closer and closer to humanity’s best-by date. Some say we are already over the line but I do not believe this is the case – that said, it is not very far off, no more than a very few years. So, how do we get through the door? Some would say, where do we go from here? Those are the questions. 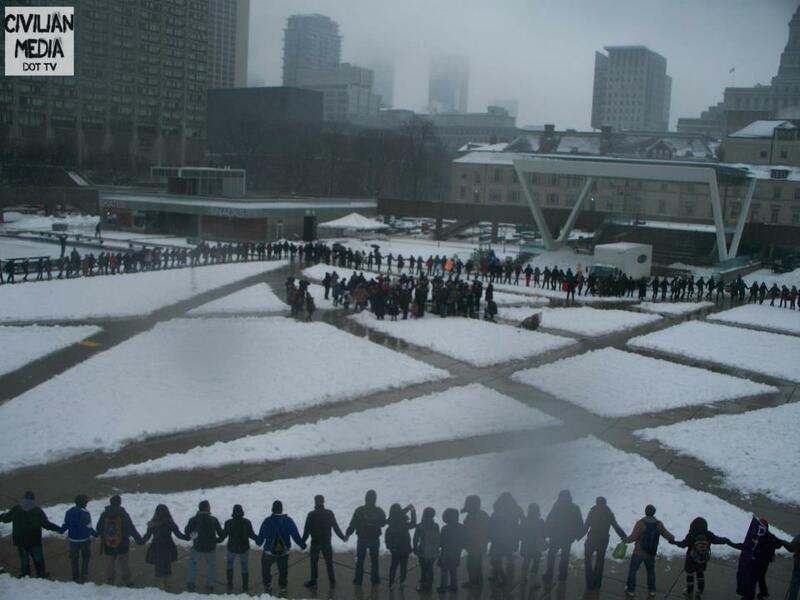 I think it will take a few months for the apparent failure of Idle No More to be absorbed and processed. The days are already getting noticeably longer – spring is coming. 🙂 Be well ZigZag, thanks. Evidence reveals that this legitimate Indigenous revolution is being strategically hijacked by George Soros and the Tides Foundation and that this process began before it emerged in the public milieu as Idle No More. The expulsion of traitors and the protection of the revolution must include targeting the globalist entities that operate at the heart of the movement that as yet have not been seen, much less recognized for what they are. This is the task of the revolutionary left. Let me begin by tracing the path by which George Soros is both funding and influencing the Idle No More movement.